Optimal swath timing for canola yield and quality is when at least 60% of seeds on the main stem are showing some colour change. Should growers adjust this approach in situations that make the decision more difficult? The following many help with those decisions…. 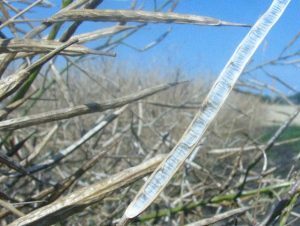 After a moist spring and summer in many areas, disease levels in harvest canola could be high this year — even for fields that received a fungicide. 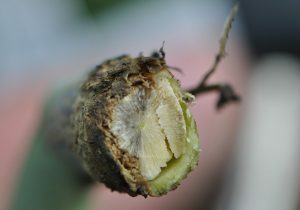 More than 10 clubroot pathotypes have been identified in Alberta, and clubroot-resistant (CR) varieties will not protect against all of them. CR varieties with the same source of resistance grown in a short rotation will quickly select for those pathotypes that are virulent to those varieties. With good moisture for clubroot this year, many fields of CR canola are showing high levels of clubroot infection. Canola Discovery Forum is your chance to work along with growers, researchers and other canola industry stakeholders to identify research shortcomings and set research priorities for Western Canada. Space is limited to 150. Join the discussion in Winnipeg October 25-27. Register now. Pre-harvest is a good time to dry down weeds to make straight combining go more smoothly. A pre-harvest application can also provide some weed control on late growing weeds — but is often too late to stop seed production. Glyphosate: Apply when the majority of seeds are yellow to brown in colour and “average” seed moisture had dried down to less than 30%. Heat plus glyphosate: Apply at 70% or more seed colour change. Reglone: Apply when at least 90% of seeds on the whole plant are brown. Know the quality and condition of the canola going in the bin. Moisture isn’t the only factor that can increase storage risk. Green seeds, weed seeds and dockage increase the risk. Even high quality canola can be at risk if stored hot. Get oil, protein and chlorophyll content, a dockage assessment and an unofficial grade of your canola simply in exchange for submitting your canola sample to the Canadian Grain Commission’s Harvest Sample Program. Quiz? Not really. More like a mystery. Here are two sets of symptoms Canola Council of Canada agronomy specialists saw this week. We have hypotheses as to the causes, but these plants have been sent off to the lab for confirmation. In the meantime, we’re asking for your diagnoses. Optimal swath timing for canola yield and quality is when at least 60% of seeds on the main stem are showing some colour change. The arrow points to a seed with a touch of colour on the green. This counts as colour changed. 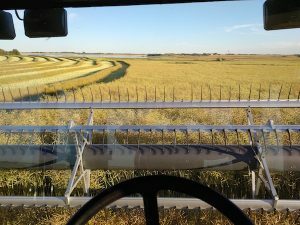 Most canola growers are familiar with straight combining, even if most have not tried it yet. New varieties with pod shatter resistance have helped with the overall comfort level for the practice. 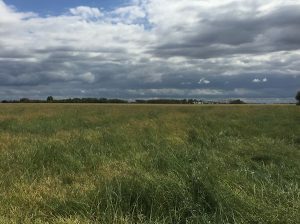 This article looks at situations where swathing may still have an advantage over straight combining. A few fields were sprayed for bertha armyworm in the past week, but these are fairly isolated cases. In general, the worms have been a low threat to canola this year. But some fields can encounter higher populations while others nearby have few or none.